Razors for Your Eyebrows? Read On! It might sound a little strange at first, but the days of painfully plucking or waxing your eyebrows are over thanks to eyebrow razors. Now, you might have some kind of Jetsons’ style contraption in mind, but these are ingeniously simplistic little devices with comfort and safety in mind. 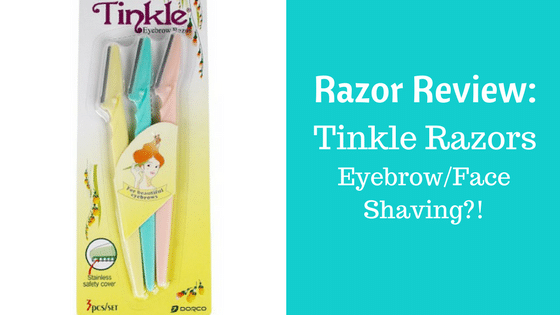 If you’re ready to get your eyebrows “on fleek,” then this Tinkle razor review has all of the information you need to know. 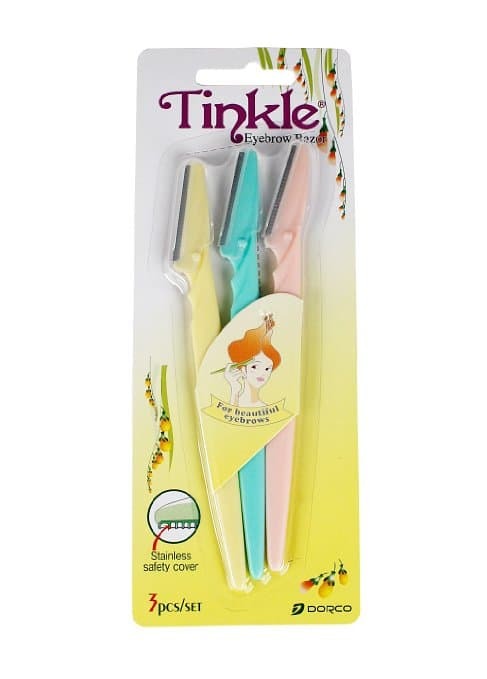 Tinkle’s line of razors are specifically designed to remove hair from the delicate parts of your face and neck. They feature an ergonomic handle that leads up to a single blade, which includes a safety guard on the sides to avoid any painful shaving nicks. They come in a pack of three featuring a blue, yellow, and pink handle. Each razor comes with a protective slip-on cover, and the back of the packaging includes instructions on how to use them. They’re roughly 6 inches long, and about as thick as a quarter, making them excellent to take with you on the go. Aesthetics aside, though, the real question is whether or not they work like they’re supposed to. Are they actually better than waxing or creams? The shaving process is simple, just glide the razor across your skin in a downward motion. The instructions also recommend using shaving cream to make the process more efficient, which might be best if you have coarser facial hair. There are two times you might find yourself using this hair remover, on the go or during your daily routine. So, we’ve broken down its effectiveness in each category for this Tinkle razor review. Using this product at home gives you the ability to combine it with moisturizers and other skin care products, which make a world of difference on how gentle this process is on your skin. Keep in mind that shaving is always most comfortable during or after a shower since your pores are open. There’s no denying that the Tinkle razor’s hair removal process is a smooth one when used at home. 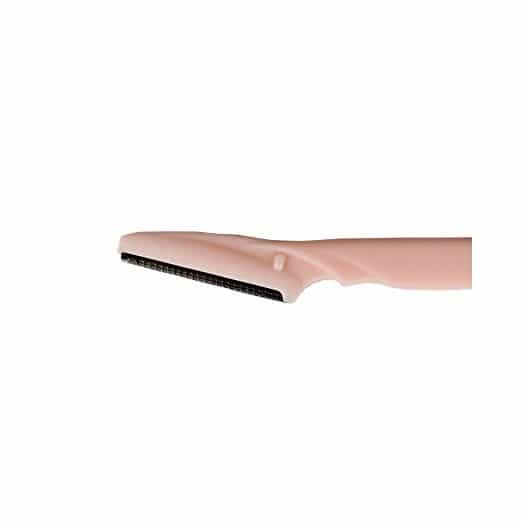 The blade slides smoothly across the skin without pinching or pulling, and even removes smaller hair that a tweezer simply could not. Whether you’re on your way to an important interview or an equally important date, it helps to look your best. 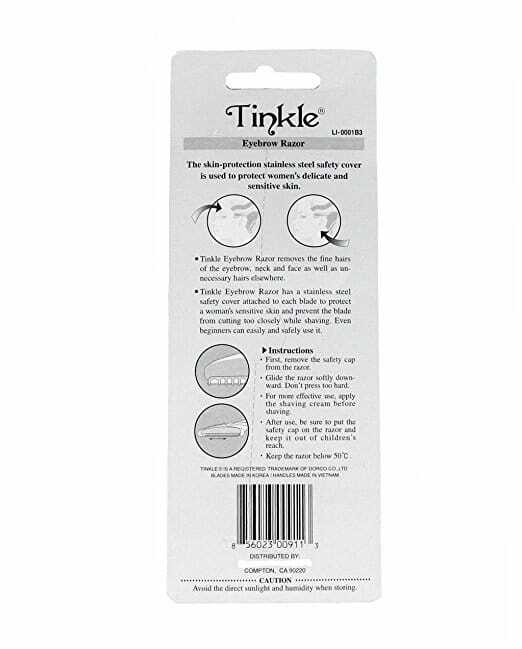 While you might expect a razor on dry skin to cut the skin or tear out hairs, Tinkle’s version does an amazing job of protecting your skin thanks to the steel safety cover. While the experience can’t compare to using one with shaving cream or a moisturizer, it gets the job done painlessly. Even without the added products, you won’t experience any razor burn or irritation. While the packaging says to glide the blade straight down, you’ll have to angle it if you want to scult your eyebrows or other areas. You may also want to go over the hairs an additional time using an upwards motion to get the smoothest results. The handle is a comfy fit in the palm, making it easy to maneuver around different areas of the face. While these are designed specifically for your eyebrows, you won’t have any trouble using them on your ears, neck, or anywhere else you’d like to remove hair. All in all, they’re highly versatile little blades. Compared to similar models, the design of these razors is safer on the skin while providing an effortless way to achieve smooth skin. Some mechanized models cut and tear at different angles, while others simply do not feature a protective cover. After gliding the blade downward then upward over several areas, the skin was left as smooth as can be. There were no bumps or leftover hairs like you might find with waxing or hair removal creams, and not a cut to be found. Compared to the effectiveness of other products, these little plastic razors are every bit as effective without the hassle or cost of treatment. When it comes to creating smooth skin, this Tinkle razor review gives it a 10/10. Learning how to angle the blade for different areas of the skin takes a little getting used to, as does how much pressure you should apply. This is a minor con, though, as it only takes about 5 minutes to figure out. One main concern with this product is the number of fakes circulating in the market. If you’re worried about knowing the difference between the real deal and a knockoff, there are two sure-fire ways to spot a fake. Real Tinkle brand razors are sold exclusively in the US and feature a DORCO logo on them. Without these two features, forget it! You’ll end up with a horribly crafted product guaranteed to wreak havoc on your face. These are disposable, which might be a deal breaker for some people. However, that keeps you from holding on to one blade for too long or worrying about losing them if you’re traveling. One last point of concern, the plastic blade cover comes off easily. This can cause an issue if you take them with you in your purse or pocket. It might be a good idea to secure the cover with tape, so you don’t end up cutting a finger. After using this nifty little device, it boasts an impressive close-skin shave with and without shaving cream or soap. They’re easy to use and an excellent choice for sensitive skin. Add all of that to the ease of taking them anywhere you go, and you have a high functioning razor. While they might not be the most high-tech option on the market, Tinkle proves that simple is better. If you’re interested, click the image below to purchase. These ones from Amazon are authentic — be aware of others that aren’t! Always check the reviews.